If you are a follower of our blog and social media, then you know we love to take an occasional break from talking about everything Ottawa, and talk about something else we love- great food and dining! For our Louisville area readers, we hope we can share with you some special places we recommend, and for our readers out of town, we hope you will try some of our suggestions when you visit Louisville. Up on the blog this week is a new favorite of ours- The New Albanian Brewery! 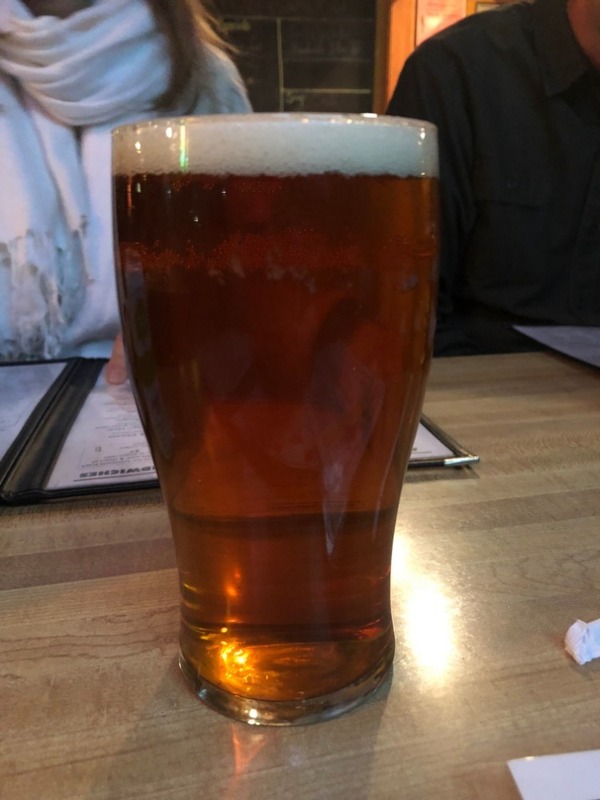 Located just over the bridge from Louisville in the city of New Albany, The New Albanian has 2 locations with fresh, locally brewed beer and two totally different food menus! 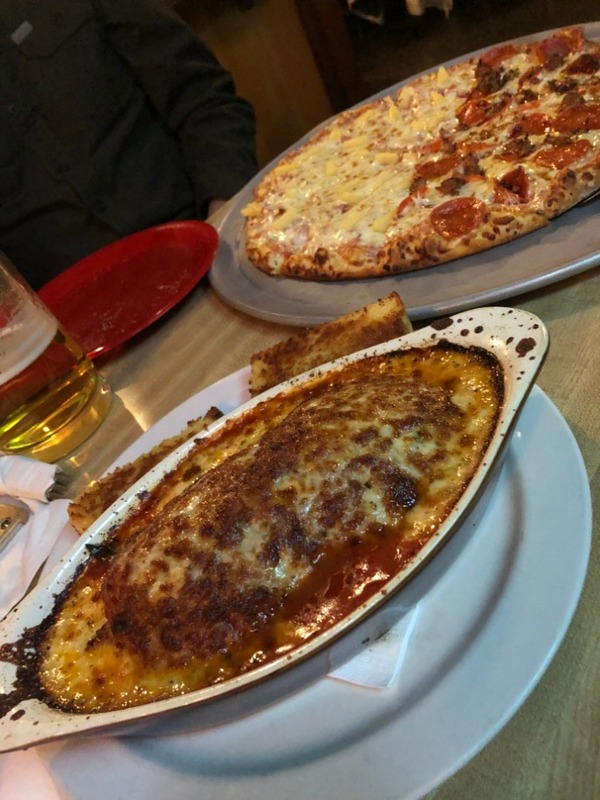 We recently made a special visit to one of their locations, The New Albanian Brewing Company Pizzeria & Public House, and we wanted to share about the experience we had as well as some of the history we learned while we were there. More, than just great pizza and beer. The New Albanian has been open over 30 years and began brewing about 20 years ago. They originally opened as "Sportstime Pizza" at the Plaza Dr. location, but within a couple of years Rich O's BBQ was added to the same location. Rich O's and Sportstime shared a kitchen and in the early 90's, Rich O's decided to venture into brewing beer. The current owners, sisters Amy Baylor & Kate Lewiston, took over and in the mid 90's established what we currently know today as The New Albanian Brewery. The New Albanian brewers craft beer onsite at both locations, the downtown location (415 Bank St.) and the Public House location (3312 Plaza Dr.), both located in New Albany. It's great local and award-winning beer and the food options pair perfectly. Nearly everything is made from scratch, which you will most certainly be able to taste in their dough as well as many other menu items. On our recent visit, we tried a few different options and we wanted to share a bit about our experience. You really can't go wrong here. The pizza is incredible. Flavorful sauce with a perfect balance of cheese and toppings. If and when you go, you of course need to try the pizza! 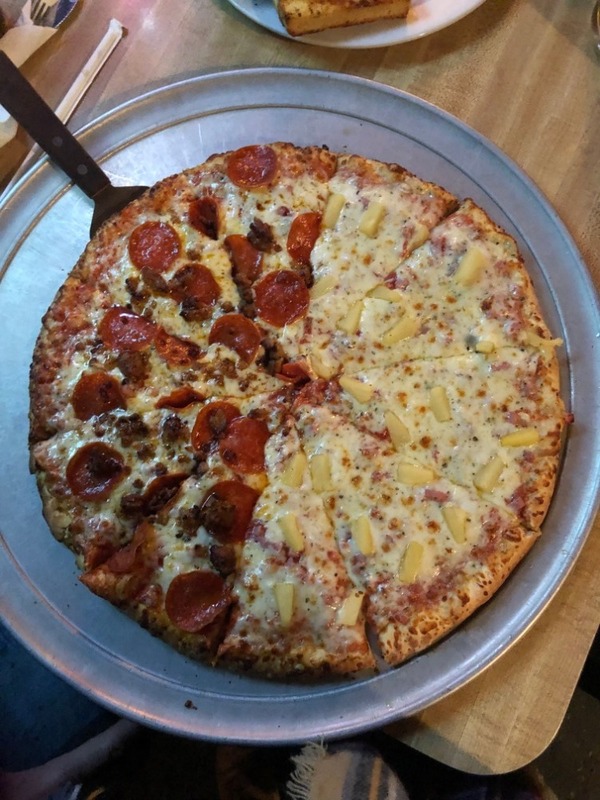 We did a 1/2 & 1/2 with pepperoni & sausage on one side and Hawaiian on the other. The New Albanian allows for quite a bit of customization, so we were able to order exactly what we were wanting. The pizzas are also a great price for the size options! Multiple sizes are offered from a small, personal size all the way to one to feed the whole family and beyond. 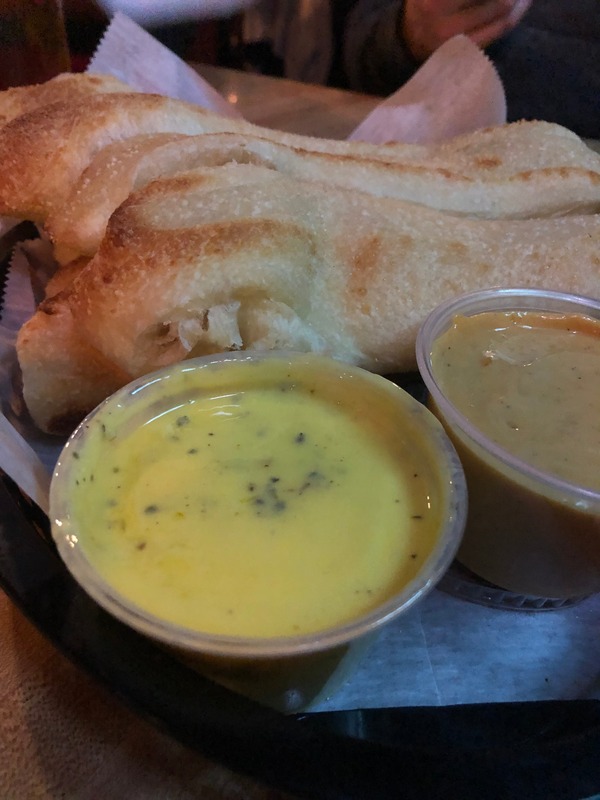 We started our dinner off with bread sticks with both garlic butter and beer cheese for dipping. You won't want to skip either of these two sauces, they were both unique and paired perfectly with the bread sticks, which had the perfect toasted crust with a soft and doughy center. Like many of the other offerings from The New Albanian, the bread sticks are made from scratch daily. While all of the appetizers are delicious, be sure you don't miss out on the bread sticks! Like everything else at The New Albanian, the lasagna is made to order. You can pick your fillings. If you are a standard meat or cheese lasagna person, of course those options are available too, but there are endless ways to customize your pasta to have exactly what you like. When we sat down with management, one thing they said is that their pasta is "the hidden gem" of the restaurant. Of course everyone knows and loves their pizza, but the pasta is incredible and should absolutely be tried as well. We only ordered the lasagna on this trip, but they also have baked spaghetti, spaghetti & meatballs, and a few other pasta options. Take our word for it, try the pasta! 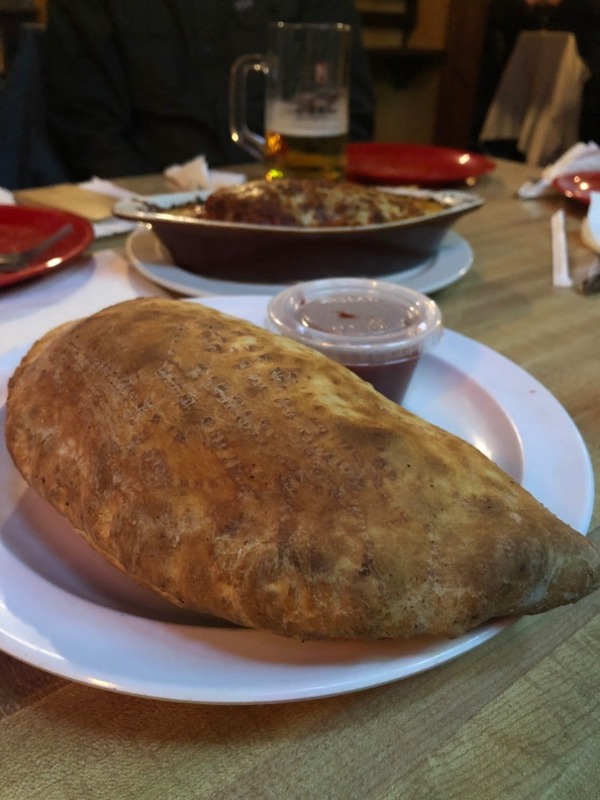 If you are a fan of calzones, you've got to try New Albanian's calzone! With up to 10 toppings/fillings included, you can get it just the way you like. It's also the perfect amount of breading, not overly doughy, and perfectly light and fluffy. I packed mine with ricotta, artichokes, pepperoni, roasted red peppers, banana peppers, sausage, and olives. It's safe to say I went a little crazy with the fillings, but it was delicious! If you are a fan of IPA's you've likely heard of the New Albanian "Hoptimus." It's a fairly popular beer and you can find it in stores and restaurants. I had tried the Hoptimus before so I went with a different IPA this time, the "Highland Railway". It was super flavorful and a great choice that I will be ordering again in the future. If you are a fan of IPA's this is a beer you should try. 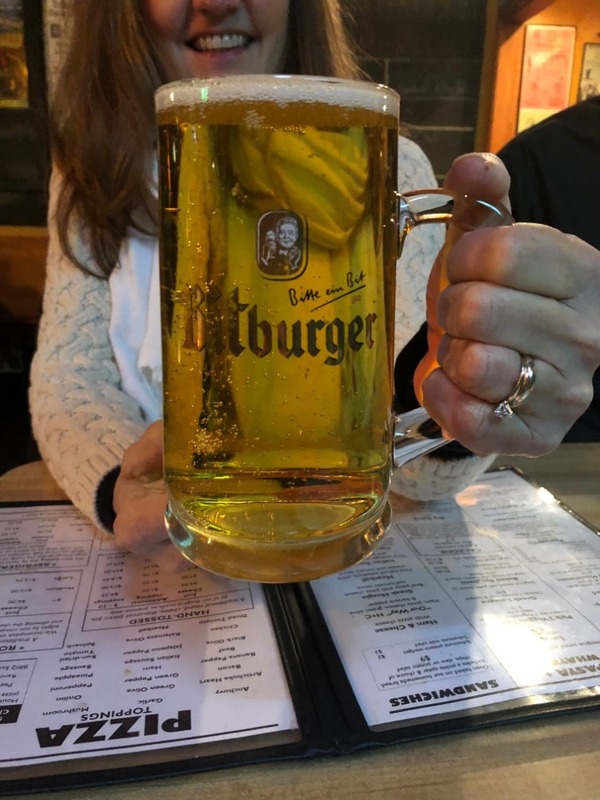 The New Albanian Brewery & Public House is a solid choice for a laid back evening of fun and delicious eats and brews, in a location that is filled with history and deeply tied to the New Albany, IN community. So much so they named a beer after a local tattoo artist, Amber Bananafish. The "Bananafish" beer is a red amber ale with hints of spices. The Bananafish is not currently being offered, but many other beers with references to the community of New Albany are. If you are in the Louisville or Southern, IN area, we suggest you stop in for some pizza or pasta and a good local brew. If you are one of our readers not local to the Louisville area, we suggest adding The New Albanian to your list of local spots to visit the next time you come to Louisville. At Louisville Switching, we are a family owned and operated business for over 40 years. We love being your go-to for all things yard trucks, from purchasing, refurbishments, parts & more. Though we serve a very large area, and even ship all over the world, we still love taking a minute to focus on special local places & restaurants in our hometown that offer unique and delicious food as well as a fantastic experience and service. New to our company? You can read more about why we love the local food scene here, or what we are about here. Or you can simply contact us, we would love to be your go-to for all your yard truck needs.